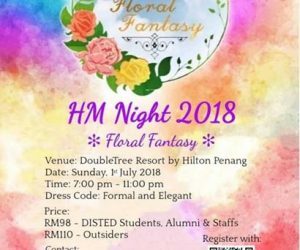 DISTED School of Hospitality Management is organising our annual Hospitality Night. This event is organised by students for students. The Objective of the event is to bid farewell to the seniors that will be graduating soon and to welcome the juniors to the school. This will also be another opportunity for us, colleague, to get together. On behalf of DISTED School of Hospitality Management, it is with great pleasure that we extend the invitation to you. It will be held at DoubleTree Resort by Hilton Penang on 1st July, 2018 from 7.00pm to 11.00pm. The ticket is priced at RM98.00 for DISTED staff and Alumni, RM110 for public. The attire for the night is elegant formal wear. It would be our honour to have your presence on this auspicious occasion. Please confirm your attendance by 22nd June 2018, Friday. If you are attending, please register using the QR code below and my students will make an appointment to see you for the collection of ticket money. I look forward to your favourable reply. Thanks you. 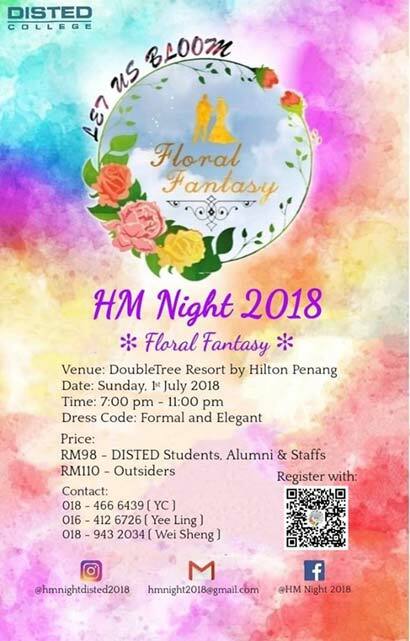 An invitation from Miss Nurul Nadia, the chairwoman of HM Night 2018 of School of Hospitality.